Ahuna Mons /əˈhuːnə ˈmɒnz/ is the largest mountain on the dwarf planet and asteroid Ceres. It protrudes above otherwise smooth terrain, it is not an impact feature, and it appears to be the only mountain of its kind on Ceres. Bright streaks run top to bottom on its slopes; these streaks are thought to be salt, similar to the better known Cererian bright spots, and likely resulted from cryovolcanic activity from Ceres's interior. It is named after the traditional post-harvest festival Ahuna of the Sumi Naga people of India. In July 2018, NASA released a comparison of physical features, including Ahuna Mons, found on Ceres with similar ones present on Earth. The mountain imaged by the Dawn spacecraft. North is down. Ahuna, harvest festival of the Sumi Naga from India. The mountain was discovered on images taken by the Dawn spacecraft in orbit around Ceres in 2015. It is estimated to have an average height of about 4 km (2.5 mi; 13,000 ft) and a maximum height of about 5 km (3.1 mi; 16,000 ft) on its steepest side; it is about 20 km (12 mi; 66,000 ft) wide at the base. It has been proposed that Ahuna Mons formed as a cryovolcanic dome. It is the closest cryovolcano to the Sun yet discovered. It is roughly antipodal to the largest impact basin on Ceres, 280 km (170 mi) diameter Kerwan. Seismic energy from the Kerwan-forming impact may have been focused on the opposite side of Ceres, fracturing the outer layers of the area and facilitating the movement of high viscosity cryovolcanic magma (consisting of muddy water ice softened by its content of salts) that was then extruded onto the surface. Crater counts suggest that formation of the mountain continued into the last several hundred million years, making this a relatively young geological feature. (locations noted by the red and green coloring in the bottom right image). Ceres viewed by Dawn. The north face of Ahuna Mons projects above the center of the limb. North is down. Context view of the mountain surrounded by lightly cratered terrain. Bright spots on Ceres can be seen at 11:00. North is up. Elevation exaggerated by five (6 August 2015). Wikimedia Commons has media related to Ahuna Mons. ^ a b "PIA20348: Ahuna Mons Seen from LAMO". Jet Propulsion Lab. 7 March 2016. Retrieved 14 April 2016. ^ Stone, Maddie (1 October 2015). "Ceres' Mysterious Bright Spots Aren't Made of Ice After All". Gizmodo. Retrieved 25 March 2016. ^ Burnham, Robert (15 December 2015). 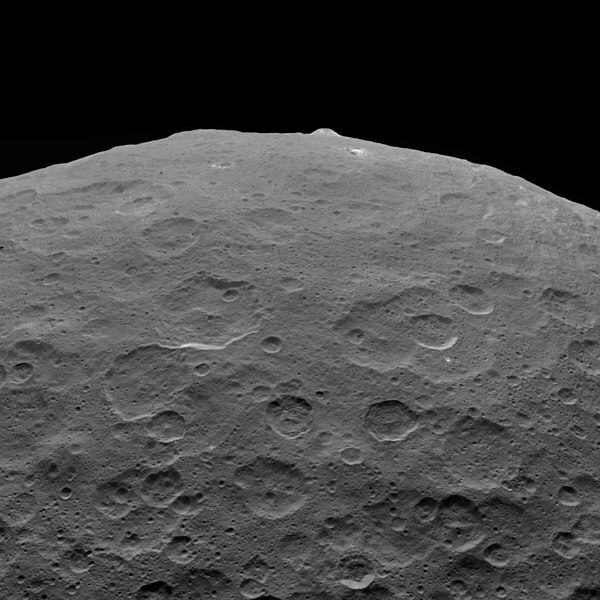 "Deep freeze puts the squeeze on dwarf planet Ceres". Arizona State University. Retrieved 25 March 2016. ^ Landau, Elizabeth; McCartney, Gretchen (24 July 2018). "What Looks Like Ceres on Earth?". NASA. Retrieved 25 July 2018. ^ "NASA spies 3-mile-tall 'pyramid,' more bright spots on Ceres". Cnet. 17 June 2015. Retrieved 19 June 2015. ^ Skibba, R. (1 September 2016). "Giant ice volcano spotted on dwarf planet Ceres". Nature. doi:10.1038/nature.2016.20526. ^ a b Ruesch, O.; Platz, T.; Schenk, P.; McFadden, L. A.; Castillo-Rogez, J. C.; Quick, L. C.; Byrne, S.; Preusker, F.; OBrien, D. P.; Schmedemann, N.; Williams, D. A.; Li, J.- Y.; Bland, M. T.; Hiesinger, H.; Kneissl, T.; Neesemann, A.; Schaefer, M.; Pasckert, J. H.; Schmidt, B. E.; Buczkowski, D. L.; Sykes, M. V.; Nathues, A.; Roatsch, T.; Hoffmann, M.; Raymond, C. A.; Russell, C. T. (2 September 2016). "Cryovolcanism on Ceres". Science. 353 (6303): aaf4286–aaf4286. Bibcode:2016Sci...353.4286R. doi:10.1126/science.aaf4286. ^ "The Mystery of Ahuna Mons, The Lonely Ice Volcano". States News Service. 23 January 2017. Retrieved 12 February 2017 – via Gale. ^ Brown, Dwayne; Wendel, JoAnna; McCartney, Gretchen (6 September 2018). "The Legacy of NASA's Dawn, Near End of Mission". NASA. Retrieved 2 November 2018. ^ Brown, Dwayne; Wendel, JoAnna; McCartney, Gretchen (1 November 2018). "NASA's Dawn Mission to Asteroid Belt Comes to End". NASA. Retrieved 2 November 2018. ^ Chang, Kenneth (1 November 2018). "NASA's Dawn Mission to the Asteroid Belt Says Good Night - Launched in 2007, the spacecraft discovered bright spots on Ceres and forbidding terrain on Vesta". The New York Times. Retrieved 2 November 2018. Nemiroff, R.; Bonnell, J., eds. (19 March 2016). "3D Ahuna Mons". Astronomy Picture of the Day. NASA. Nemiroff, R.; Bonnell, J., eds. (9 October 2017). "Unusual Mountain Ahuna Mons on Asteroid Ceres". Astronomy Picture of the Day. NASA.